There are four ways to get Banished from the last surviving city on earth: 1. Cut out your emotion tracker, 2. Join a religious cult, 3. Create a rebellion against the Legislature, 4. Fall in love. Jez is on the fast-track to becoming a brilliant scientist, with one goal—save her city from total extinction. But the more Jez learns about the price of a fresh beginning, the more she realizes that carrying out the plan will lead to few survivors, and among the dead will be those she cares about the most. Solstice is a truly enjoyable book. Jane Redd is definitely a talented writer which is not surprising as Jane Redd is a pseudonym for Heather B. Moore, a USA Today best-selling author. Solstice carries its own honor as a top 10 seller in two of Amazon’s categories, YA Science Fiction, and Teen Romantic Thrillers. I usually have a lot to say about books; yet I don't about Solstice. Solstice is a book that I began reading and just kept on reading. No stopping to take notes. No frustrating issues. Not one. Solstice is a book that I just relaxed and truly enjoyed. Redd does leave you hanging at the end though so I’m looking forward to the next book in the series called Lake Town. 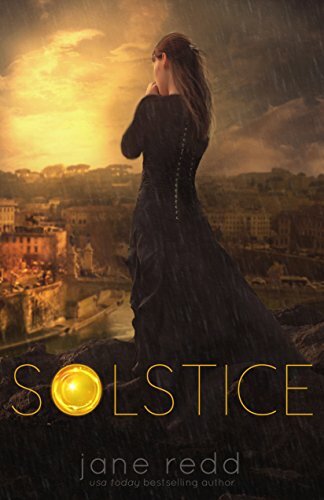 Solstice is an interesting and fast-paced read. I recommend that you relax and enjoy reading a copy. Writing under Jane Redd, Heather B. Moore is the USA Today bestselling and award-winning author of more than a dozen historical novels set in ancient Arabia and Mesoamerica. She attended the Cairo American College in Egypt and the Anglican International School in Jerusalem and received her Bachelor of Science degree from Brigham Young University. She writes historical thrillers under the pen name H.B. Moore, and romance and women’s fiction under the name Heather B. Moore. It can be confusing, so her kids just call her Mom. Heather is represented by Jane Dystel of Dystel, Goderich, and Bourret. Join H.B. Moore’s newsletter list for updates. Visit JANE REDD BOOKS on Facebook for series updates.